Is it better than the HTC Magic already? 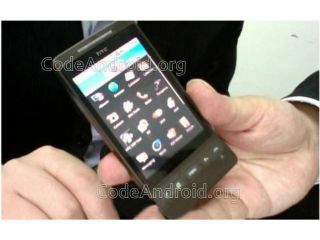 Not content to bring out one of the phones of 2009 in the HTC Magic, the Taiwanese company has been showing off the HTC Hero, its next Android offering. After hinting at such a device in its leaked 2009 line-up, the Hero has finally surfaced in the real world, and looks like it's following the G1 and Magic lineage we're now used to, thanks to the inexplicable lip at the bottom. But it has one thing the Magic and G1 don't have, and that's a 3.5mm headphone jack, which is something the world has been hankering after in an Android phone for ages (and something Samsung is bringing in a couple of months with the i7500). It seems to borrowing the angular stylings of the HTC Diamond range from the blurry pics sent in (which you can see more of over at CodeAndroid), but has ditched the trackball we've grown to love on the previous two Android offerings. This really does look like the real deal, and in many ways makes perfect evolutionary sense, especially as HTC has promised more Android handsets this year. If we were to have a guess, it would be that this phone is equipped with a more powerful processor and better camera, especially as HTC has told TechRadar that's going to be a big focus (excuse the pun) for the future. Word is that we'll be seeing this little beauty in the next four or five months, which is certainly enough to get excited over, especially as the HTC Magic performed so well in a recent review.